This is an article from our archives that was previously run on another site in July, 2008. After that happened, they had to “make due” with the 70 hectares that the family kept in Austria just on the other side of the border. In 1993, these lands were returned to the family after decades of pumping out cheap bulk wine that was mostly sold to Russia. 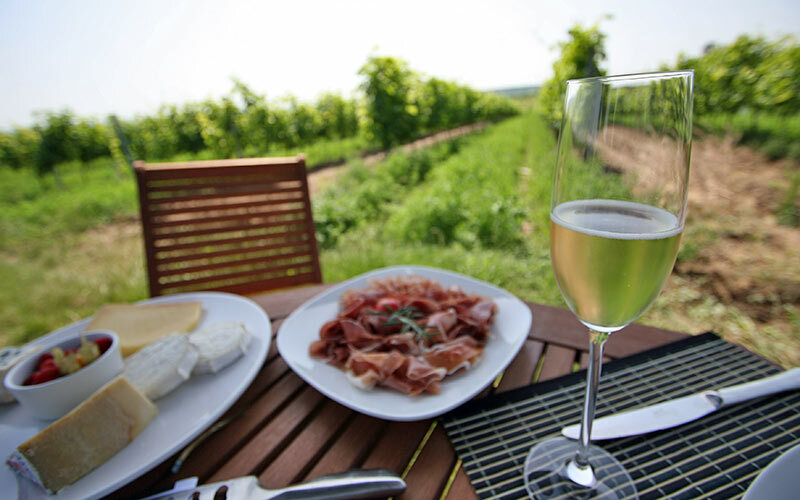 By this time, on the Austrian side they had been making very well-recognized wines and in what must be one of the most incredible gifts I’ve ever seen from a parent, they gave this 27 hectares to their daughters to work up and establish as a Hungarian winery. These stories are not uncommon in the area of Sopron (pron. Shohprohn) in the far west of Hungary on a peninsula of territory that sticks in to Austria, right in to the middle of the very nice Burgenland winegrowing region. The Pfneisl sisters (they grew up in Austria, thus the spelling), Birgit and Katrin have now been running the vines for several years and bottled their first vintage in 2004. A good deal of replanting happened 12 years ago to replace a number of vines, although some of their older vines still remain. These days, they’re growing Kékfrankos, Cabernet Sauvignon, Syrah, Merlot, Sangiovese, Malbec, Carmenére, Zenit, and as amazing as it is, even some Zinfandel. Birgit’s study of winemaking around the world quickly becomes evident in the diverse selection of grapes. While they have a tasting room near the center of Sopron, they took us out to a tasting amongst the vineyards overlooking Lake Fertö, which is a wide, flat, reedy lake that is at most two meters deep. Once up in the vineyard, one can see that it creates for an excellent micro climate that allows for a great deal of sun to hit the vines all year. Overall, you can taste this in the wines, as they hold a great deal more depth than other wines from just over the hill. But, enough about history, let’s talk about the wines themselves. 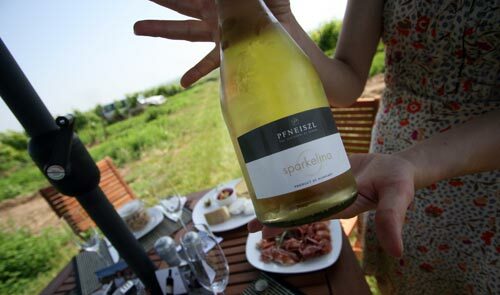 We started off with their take on the Sparkling White Wine, which they call Sparkelina. We tasted the 2007 vintage and found it to be not too dry and very even-tempered. It has a clean finish and while I’m not a huge fan of the bubbly in general, I found their version to be quite pleasant and pleasing to drink. From there, it was on to the Kékfrankos 2006 ‘Classic’. It’s a blend of grapes that have been aged in stainless steel with 30% in old Hungarian barrels. The nose is very calm and mild. The body is easy to drink and rather light and seemingly typical of Kékfrankos from the region, but light blackberry tones give way to a touch of pepper and other spices that you can taste near the end and in to the finish of the wine. It was then on to one of Pfneiszl’s signature wines, which is the Tango. We tasted the 2006 which is a blend of 30% Cabernet Sauvignon, 60% Merlot, and 10% Syrah. The nose is light with a hint of vanilla and stronger blackberry elements to it. The body is smooth and the finish is pleasing. As the wine breathes more, it becomes more and more pleasing and is a wine that I would really recommend for just bout any meal as it is even-tempered and mellow, while at the same time carrying a good deal of flavor. The Kékfrankos 2004 is a vintage that was aged in barrique for 22 months. Again, the nose has blackberry aromas to it, but it develops a slightly more complex nature with herbs coming through. A number of the aromas drop out in the body, but the berry tones stay quite prevalent and the body is a good deal more dry than the other wines of theirs we tasted, yet it is still quite pleasant. The 2005 Shiraz has what I describe as a very creamy body which according to Birgit is from an extended fermentation period in the barrels. The barrels are French oak due to the 18 month stay in them, the wine takes on a number of vanilla qualities. Their 2004 Cabernet Sauvignon proved to be a nice surprise. Other Cabs from the region, I’ve often found to be rather flat given that I’ve been spoiled growing up on California Cabs. But the Pfneiszl Cab is not flat at all. It is dry, but very flavorful. The body is complex and earthy. It doesn’t have the uninteresting “cherry nose” to it that I’ve often found in other Central European Cabs. Birgit said that it had just been bottled a few months previous, so it was still under a bit of bottle shock, but irregardless, it was a very enjoyable wine to drink. Perhaps this is due to the 24 months it spends in Hungarian barrels. The Impression Rouge is a blend of 50% Kékfrankos, 25% Cabernet Sauvignon, and 25% Merlot. There is good deal more oak to it, which is probably due to the newer barrels that are being used. The finish has a delightful touch of boysenberry to it, which was quite unexpected. It is also a delightful wine to drink with deep, woody tones. One thing to note about these wines is that Birgit’s style is to allow the wines to be a bit more “wild” in their flavors. She doesn’t try to force a particular consistency to the wines and this allows them to each be their own and age as they may. While this may be a death knell for other younger winemakers, she manages to work the wines in this manner with a great deal of success, making each Pfneiszl vintage quite unique. To this end, they also give each wine vintage its own name based upon how they feel the grapes tasted for that year. For instance, 2004 was, “Cool Elegance” and 2005 was “Starling’s Favorite”. It’s a nice touch that makes the wines have a bit more character than just a numerical year on them.